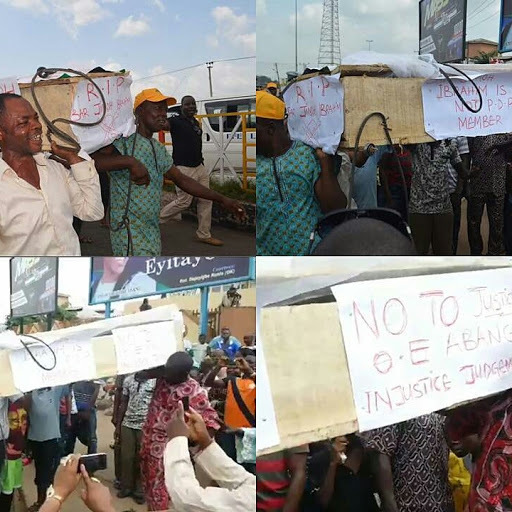 Ondo protest, Saturday, took a new twist as pro-Jegede supporters were seen carrying a mock-coffin bearing some inscriptions such as “R.I. P Bar. Jimoh Ibrahim,” ” No to justice O. E. Abang,” and “Injustice Judgement” as well as chanting a dirge to accompany it. Recall that INEC, had, Thursday October 27, announced Jimoh Ibrahim of the Modu Sheriff faction of the PDP, as the true candidate for the coming governorship election in the state while substituting that of Eyitayo Jegede who belongs to the Ahmed Makarfi-led faction of the party.